The dome of the Florence Cathedral is, in our opinion, the greatest sight in Florence.The dome is a miracle of technology. Actually it was impossible to build such a gigantic dome in the 15th century. The builder Filippo Brunelleschi managed it nevertheless, although he was no architect at all. It is not unusual to have to wait in line at the cathedral for hours. This is especially true for the passage to the famous dome. It is extremely annoying to spend a few hours of a valuable holiday in a queue. We therefore recommend booking a tour to the dome of Florence on the Internet. One can book such tours on this German speaking web page in peace at home on-line. The dome on the cathedral has a diameter of 45 meters. It is almost as big as one half of a football field. The church dome rises 107 meters into the sky. 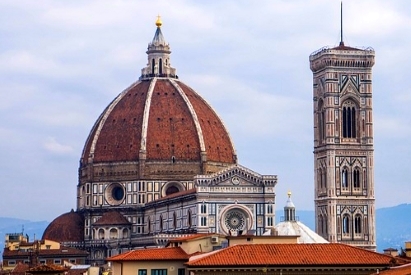 Thus the dome of the cathedral of Florence has a larger height than the church tower. Four million bricks were used. Both the production of so many bricks and the lifting of the many building materials to such a great height were never before accomplished masterpieces. The inventor Filippo Brunelleschi built a completely new lift for the many bricks and the mortar. It was operated with two oxen walking in a circle. Today the dome of Florence is considered the largest historical dome in the world, the cathedral itself is the fourth largest church in the world. For over 437 years, the cathedral dome in Florence was the largest dome in the world (1436-1873). It was not until the 19th century that a larger dome was erected on a factory building in Vienna. The highlight is the ascent to the dome, but one should also look at the building from the inside. Climbing the dome is possible for tourists and the highlight of the trip for many Tuscany vacationers. The problem is that Florence is one of the top destinations in Europe and only a limited number of people can climb the dome. This means that there are sometimes enormous waiting times all year round. Quite often the queue at the dome entrance is several hundred metres long. But you can avoid the queues if you nook a tour (see yellow box). You should be fit enough to get out and have no fear of heights, claustrophobia etc.. The dome can be viewed from the inside of the church. The dome was painted by Giorgio Vasari and Federico Zuccari between 1572 and 1579. The 4000 m² fresco is considered to be the largest in the world (The World Judge or The Last Judge). After a long construction period the cathedral of Florence was finished in large parts, the inhabitants of the city had a problem. Nobody knew how to build such a large dome. The hole in the ceiling of the cathedral had a diameter of about 45 meters. Never before had such a large church dome been built until this time (beginning of the 15th century). They looked for solution and they draf a courageous decision. 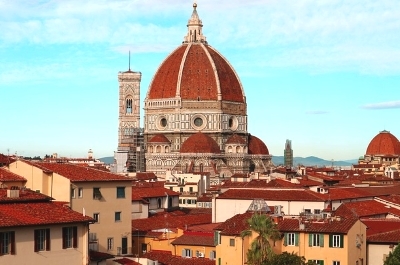 The Florentine goldsmith Filippo Brunelleschi was commissioned to build the gigantic dome on the cathedral. He was the only one who promised to build the gigantic building affordable. The skepticism was great because Brunelleschi was not an architect and had never built anything. Actually, such a construction is impossible. The millions of bricks have such a high dead weight that such a dome has to collapse during construction. Among other things, Filippo Brunelleschi invented the so-called herring system. The bricks are arranged alternately lengthwise and crosswise. This gives the walls much better stability. Brunelleschi managed the construction of the dome of Florence Cathedral in only 16 years (1414 to 1434). The cathedral was then one of the largest and most important buildings in the world. The dome of Florence was the largest in the world. The cathedral became the symbol of a new age – the Renaissance, the revival of antiquity. Filippo Brunelleschi was inspired by the Pantheon in Rome, by far the largest ancient dome from the Roman era. But the dome of Florence was much larger. Some experts even think that the work of the goldsmith Brunelleschi is the greatest achievement in architecture in the history of mankind. We do not know exactly how Brunelleschi built the dome 600 years ago. The famous professor of architecture at the University of Florence Massimo Ricci has been reconstructing the dome of Florence in a 1:5 scale model for many years. 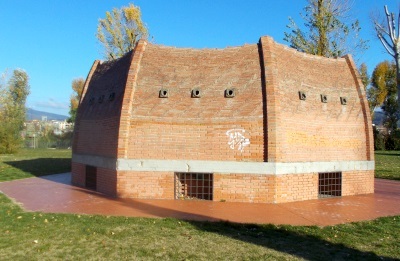 The „small dome“ can be found in the park „Parco Dell’anconella“ 3-4 kilometers east of the cathedral on the other side of the river Arno. The unusual arrangement of the bricks (herring system) is clearly visible from close up.